WORLD AT WAR: Stalker class is well geared for crowd control. EVER since the early days of the first World of Warcraft expansion, there has been a prophecy. It spoke of the WoW killer. The one that would be everything MMOs could be. False ones have come and gone, leaving countless disappointed and Cheetoh-stained players in the wilderness, searching for the one game that would combine features and gameplay and the lore that could give them gaming nirvana. Wildstar is our best hope yet, and the otherwise salty community who pines for the one to come is actually allowing hearts to open a little this time. 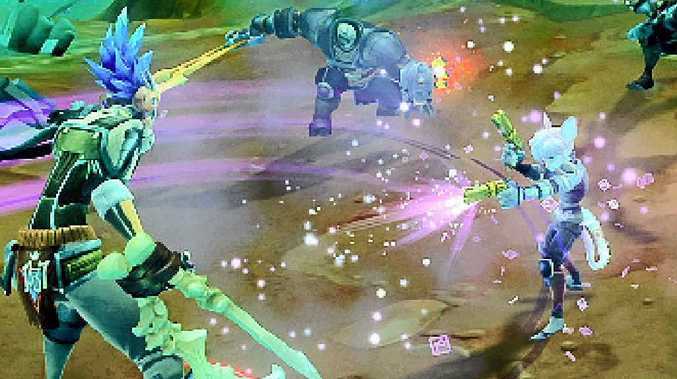 Wildstar is basically a sci-fi MMORPG that's learned from the past 10 years of MMO development. Two factions, the obviously "good-guy" Exiles and "bad-guy" Dominion have found a new planet and are in the process of fighting over it. Each faction has four races with drastically different appearances but with nothing in the way of racial ability differences - which seems to have tempered the "go with the best one" ethos that takes the fun out of other MMOs. The class system is brilliant, with the holy trinity thrown away almost entirely. The tank who keeps the monsters occupied, the healer who keeps everyone alive and the DPS (damage per second) who stands back and tries to kill the monster are gone as a formula because, in the end, it sucked to be the DPS. Every class in Wildstar can output significant amounts of damage. The main variations this time are that some classes will "tank" better, some will "heal" better, and some will provide other utilities like crowd control. Alongside that drastic departure is the addition of a third element to the MMORPG model: paths, which are careers like explorer, soldier, and scientist that your character can engage in as they go through each zone of the game. Careers will supply bonuses, items and experience for characters but will also directly influence the world for other players. A tank class with robotic minions that takes a tremendous beating and can still output damage with the best of them. Engineer was one of the more popular classes during the beta. A utility spellcaster class that stands back and heaps damage and crowd control on enemies while staying more stationary than almost any other class. Powerful and yet tricky to play. While the Esper can heal, the Medic is built for the job, with AOE heals coming for days while it unloads an unfair amount of DPS. Mobile, useful, lethal. Fire magic from spaceman guns while running through alien landscapes and dominating faces from left to right. Sound fun? Good, roll a Spellslinger - you won't be disappointed. The rogue class is stealthy and sickeningly well-geared for crowd control. Bonus points? You can build your Stalker to be a tank or to do even more damage. Upsettingly awesome. The meat-shield returns. The Warrior is a melee class that can be tuned for tanking like a boss or full-blown damage spewing. This class is worth playing for the massive swords, let alone the fun.